As secretary of state, Clinton accomplished little, but usually came down on the side of using force. Since it’s foreign policy week this week, with President Obama delivering a major speech on Wednesday at West Point, Christie Watch will spend the next few days looking at the foreign policy views of the various 2016 candidates, starting today with the presumptive Democratic nominee, Hillary Clinton. When it comes to Hillary Clinton’s foreign policy, start first by disentangling the nonsense about Benghazi—a nonexistent scandal if ever there was one—from the broader palette of Clinton’s own, relatively hawkish views. As she consolidates her position as the expected nominee in 2016, with wide leads over all the likely GOP challengers, it ought to worry progressives that the next president of the United States is likely to be much more hawkish than the current one. Expect to be deluged, in the next few weeks, with news about Hard Choices, the memoir of her years as secretary of state under President Obama, to be released June 10. But we don’t need a memoir to know that, comparatively speaking, two things can be said about her tenure at the State Department: first, that in fact she accomplished very little; and second, that both before her appointment and during her service, she consistently came down on the hawkish side of debates inside the administration, from Afghanistan to Libya and Syria. She’s also taken a more hawkish line than Obama on Ukraine and the confrontation with Russia. In the brief excerpt that’s been released by her publisher, Clinton notes that as secretary of state she “ended up visiting 112 countries and traveling nearly one million miles.” But what, if anything, did she accomplish with all that to-ing and fro-ing? Not a lot. She largely avoided the Israel-Palestine tangle, perhaps because she didn’t want to risk crossing the Israel lobby at home, and it’s hard to see what she actually did, other than to promote the education and empowerment of girls and women in places where they are severely beaten down. And, while it’s wrong (and really silly) to call Clinton a neoconservative, she’s more of—how to put it?—a “right-wing realist” on foreign policy, who often backed military intervention as a first or second resort, while others in the White House—especially Obama’s national security staff and Vice President Biden’s own aides, were far more reluctant to employ the troops. [Gates and Clinton] often compared notes in advance of some of those meetings to find common ground to allow them to influence or drive the direction of policy on a given issue. But in recent interviews, two dozen current and former administration officials, foreign diplomats, friends and outside analysts described Mrs. Clinton as almost always the advocate of the most aggressive actions considered by Mr. Obama’s national security team—and not just in well-documented cases, like the debate over how many additional American troops to send to Afghanistan or the NATO airstrikes in Libya. Mrs. Clinton’s advocates—a swelling number in Washington, where people are already looking to the next administration—are quick to cite other cases in which she took more hawkish positions than the White House: arguing for funneling weapons to Syrian rebels and for leaving more troops behind in postwar Iraq, and criticizing the results of a 2011 parliamentary election in Russia. Since leaving office, Clinton has gone out of her way to sound more hawkish than Obama on a range of issues, including expressing skepticism on the negotiations with Iran. 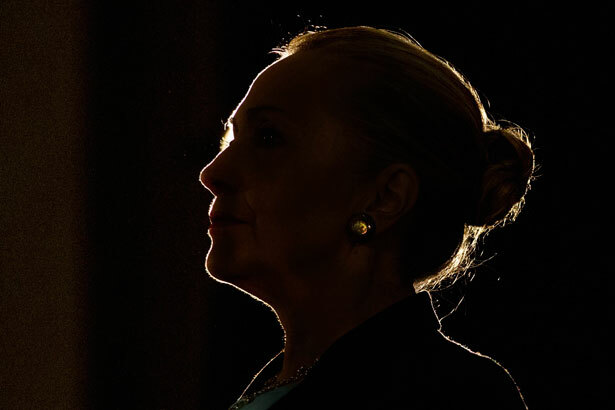 Some observers say that it’s just politics, and that Clinton is positioning herself for 2016. Maybe so. But it sounds a lot like Hillary Clinton is just being, well, Hillary Clinton.